but it seems too unbalanced...verbal percentil is amazing, but quant percentil seems to be too low. do you guys think this could harm my application? is this quant score particularly low? or am I worrying too much? Your quant score won't really stand out, but it won't hurt you either. Another thing to consider here is that Q47 is actually much better than a 61% for test takers from Brazil. Read this article to understand what I mean (Brazil was one of the examples the GMAC used to explain what the article says about quant scores). What matters is that your total score is very good (and your verbal score is amazing! ), so you really don't need to take the exam again. However, if I were you, I'd reach out to a few admissions consultants and to my target schools directly and check what they think about the Q47. Congratulations for your wonderful score! You have the score to get into any business school. With your overall score , Q47 is good enough. Your time would be better served working on the other areas of your application, and applying in R1. 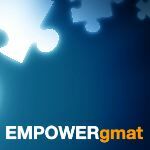 Hi acbobadilha and welcome to GMAT club! Congrats on 730.Its a very good score ! !